Markham Thunder - Clarkson Cup Champions! Original story posted on CBC Sports. 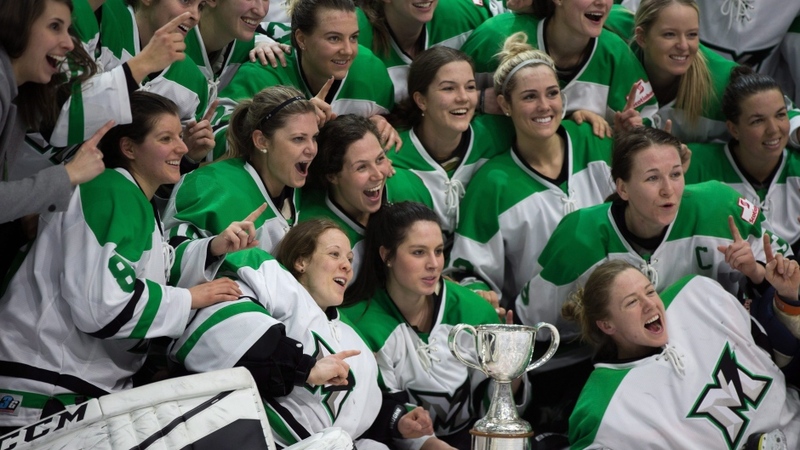 Laura Stacey scored the overtime winner as the Markham Thunder edged the Kunlun Red Star 2-1 to capture the Clarkson Cup on Sunday at Ricoh Coliseum. Stacey, a member of the Canadian women's Olympic team that won silver last month in Pyeongchang, one-timed a Nicole Kosta feed past Noora Raty with 2:11 remaining in the extra period. Nicole Brown had the other goal for Markham and Erica Howe, named the Clarkson Cup MVP, made 17 saves. Kelli Stack, named the CWHL MVP as voted on by the coaches and staff, had the lone Kunlun goal while Raty, who took home goaltender of the year honours on Friday after leading the league in goals-against average (1.60) and save percentage (.944) this season, stopped 37 shots. Sunday marked the third trip to the Clarkson Cup for the Thunder franchise. The organization also reached the championship game in 2010 and 2012, losing both years. The Thunder, who relocated from Brampton to Markham for this season, upset 2017 Clarkson Cup champion Montreal sweeping their best-of-three semi-final. As Beijing gets set to host the 2022 Winter Olympics, China is looking to build a competitive women's national team by developing players in the CWHL. Kunlun was one of two expansion franchises based in China playing in the CWHL this season. The Red Star needed triple overtime in the third and deciding game to dispatch the Calgary Inferno and earn a berth in Sunday's final. Brown opened the scoring for Markham at 8:24 of the first, lifting a Laura Fortino pass over the glove hand of Raty for her first goal of the playoffs. Shiann Darkangelo nearly got Kunlun on the board, on a shorthanded breakaway at 16:48, but couldn't beat Howe. Stacey thought she'd doubled Markham's lead five minutes into the second, picking the pocket of Red Star defenceman Jessica Wong and breaking in alone on Raty, but the puck did not cross the goal line according to officials. Then with 6:15 gone in the second, Megan Bozek beat Raty, but put her shot off the post. Despite being outshot 11-6 in the middle frame, Kunlun had the lone goal of the period when a puck deflected off Stack and past Howe with 48.6 remaining in the period. Note: Sarah Nurse and Renata Fast, members of Canada's silver medal-winning women's Olympic team, dropped the puck in a ceremonial face-off pre-game.